They Don’t Call ‘em Deer Flies For Nothing! I was going to call this entry something like “this and that” or “tying up loose ends” but obviously didn’t. I opted for a flashy title as a way to headline an assortment of thoughts. My time up here at Dollar Lake has been brief, but – as usual – it resulted in many snippets of natural observation. No one sight or scene prompted anything like a complete topic (or maybe I wasn’t really trying to think this time). Others have no photos to back them up and still others were continuations of previous posts. Call it a Potpourri of basically unrelated things. In the category of a single shot worth showing, I present the White-tailed Deer shown above. 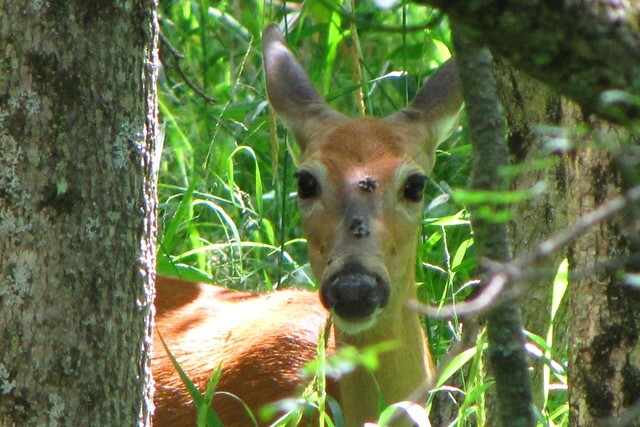 Summer deer are so much “prettier” than winter deer, but deer are always ugly and whiskery no matter the season. As you may know, I rarely waste time on deer shots. Summer deer do have that rich orangish coat to show off, so they sometimes catch my eye. Unfortunately, that warm season fur is very short and easily penetrated by biting flies. Thus the reason I am showing you this picture (see above). I stopped along a back road to look at some Cardinal Flowers (see here) and noticed that I was noticed by a nearby doe in the shady woods about 50 feet in. It was mid-day and the creature was apparently seeking some sun relief. I noticed that the noticing deer, apart from flaring her nostrils in angst, was covered with flies. Actually the flies were clustered about two spots on the snout. Ah yes, it’s good to be reminded that deer flies are called deer flies for a good reason. These pesky critters are not designed to make our lives miserable but are primarily meant to pester deer. There is justice in the world. There was another sight which I wish I could have recorded with a decent shot (I do offer this view as verification of what follows). Among the dangling grape vines and elm branches over a bubbling creek, an immature Rose-breasted Grosbeak foraged for food. I’m not sure what he was going after but what ever it was he was pursuing it with a vengeance. 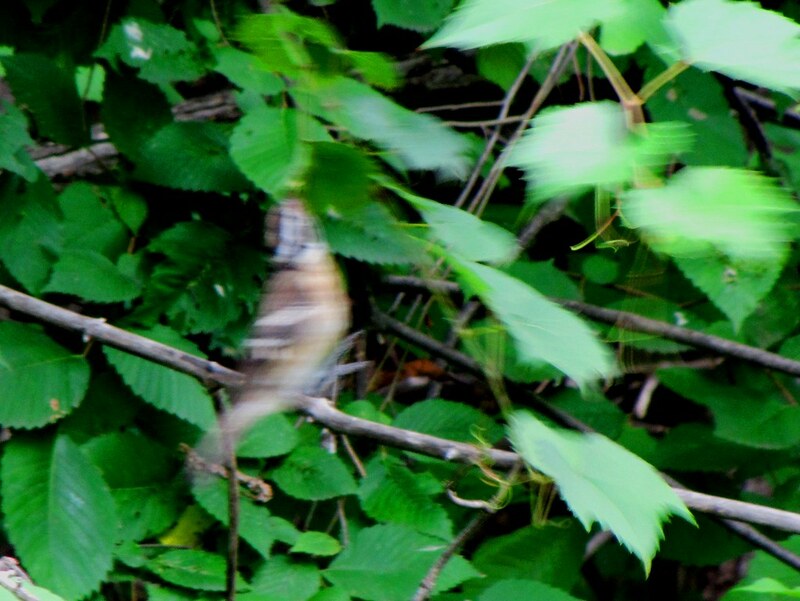 The agile brown and white bird leapt at a hanging elm leaf. At first he hovered in place next to it but then latched onto the leaf (and presumably whatever was on it), folded back his wings, and hung on like a circus performer. He swung back and forth with his feet sticking out in the air before finally dropping and resuming dignified behavior. Perhaps Grosbeaks do this sort of thing all the time or perhaps this one had aspirations of being a trained parrot. While the deer was gratifying and the Grosbeak surprising, the behavior of a clutch of turkey chicks along the road was only interesting because of my lack of turkey knowledge. I can only assume that the hen brought her chicks to the roadside in order to pick gravel. The passing cars brought no alarm to her or the clutch. My stopping to observe them, however, did cause a slight panic. The hen, head held high and neck stretched to the limit, strutted up the bank and chortled out a low cluck to her charges. All seven of the kids immediately took heed and, rather than running away through the underbrush as expected, they took flight. Turkeys don’t fly too often. They are good fliers, but are long-legged walking/running birds by habit. 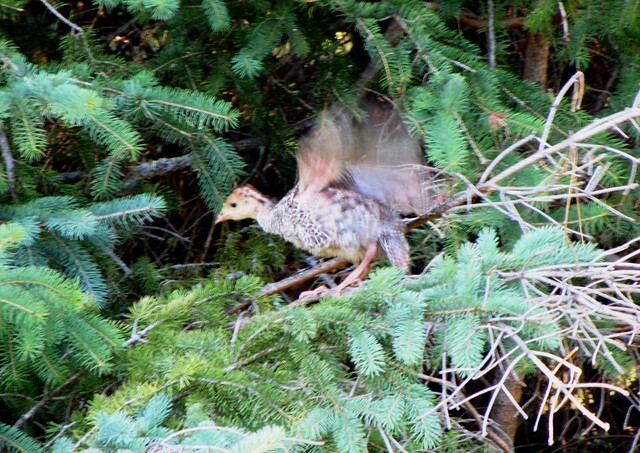 These young birds launched into a short flight of about 10 feet – enough to bury themselves into a row of dense spruces. One small fellow opted to land on a bare limb long enough to give me a clear view of a gangly young’n on an unsure perch. It too, resumed flight and dropped into the thicket. So, there you have it, a small bit of turkey ignorance (mine) remedied. Now onto much smaller concerns. A short while ago I brought the aquatic China Mark Moth to your attention. 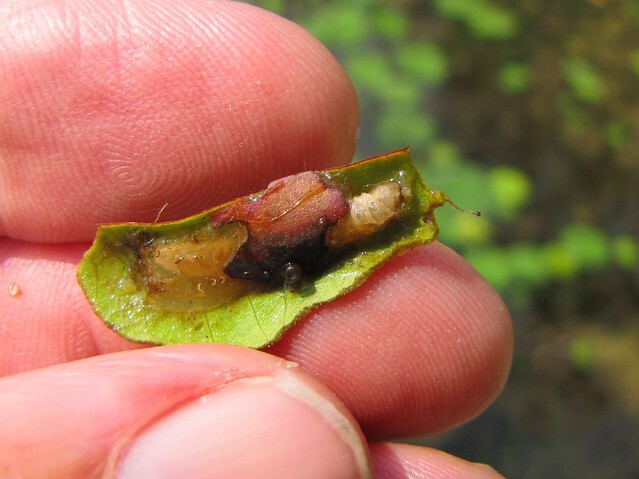 Just in case you don’t remember, this was an aquatic species of moth in which the larvae wrap themselves up in a sandwich of pre-cut lily pad leaves. One caterpillar presented itself clearly as it journeyed across the upper surface of a pad. You couldn’t ask for a better image of the sandwich moth larva, so let’s pretend this picture (see above) accompanied the China mark post (as well as this one showing the effect of multiple China-marks carving up a leaf). 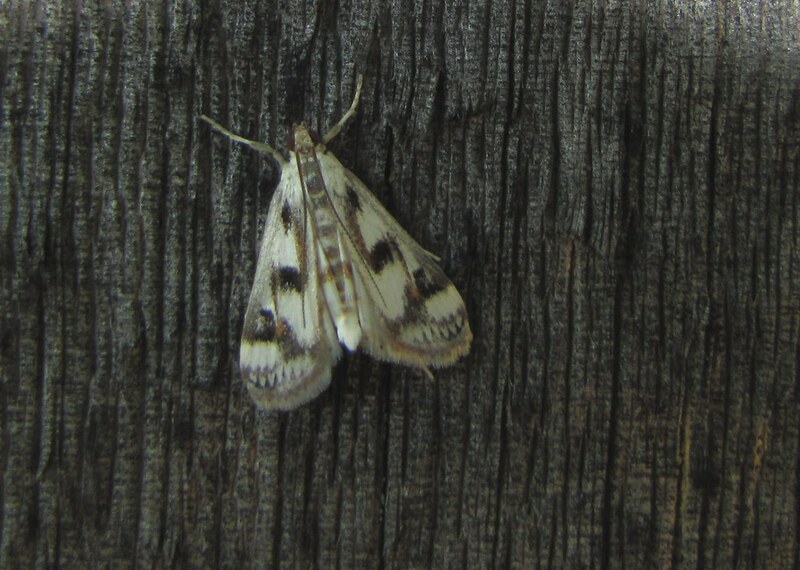 I neglected to show you a picture of the adult moth last time because there were none to be had. Well, there were plenty little white moths showing up in late July and I thought I was looking at adults of the China mark. 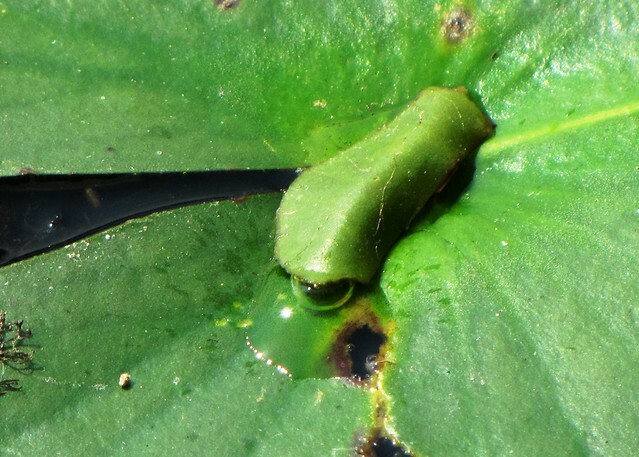 No two looked exactly alike but all were spending lots of time around the spatterdock & lily beds. It turns out that I was wrong about the adult moths. This would be only the first time I was actually wrong about something – well, maybe the second. They weren’t China marks but Polymorphic Pondweed Moths (say that three times). 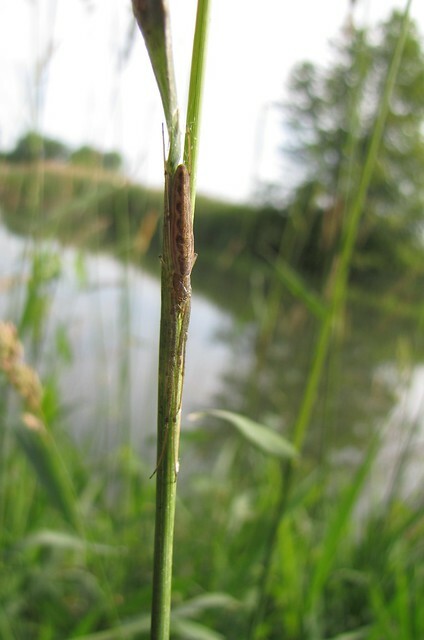 Apparently these over-named moths feed on pondweed and, like I noted, no two look exactly alike (see above and here). At least I was right about that last fact before I even knew it (what?). 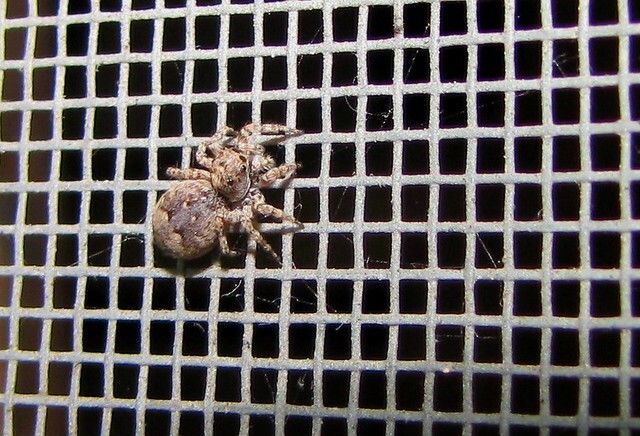 Finally, I thought it prudent to bring you a shot of my small friend the screen door spider. This tiny gray beast patrolled the lakeside screen door looking for prey and was a constant companion. There is nothing threatening about small jumping spiders – even to a nervous spider observer such as I. When viewed close up, I think you’ll agree that they are rather appealing. I am somehow reminded of the final scene in the old “Incredible Shrinking Man” by the resulting photo. In a world of circus grosbeaks, fly-blown deer, taco caterpillars, and turkeys in a tree (not the straw) this little fellow can be given his full due. There comes a time every now and then when we blunder into something that does not fit any typical description. It is always nice to categorize our findings as animal, plant, or mineral. But what can we do when our finding does not fit any of the above or any additional “normal” category? In such a case we are talking about a strange middle-earth being called a Slime Mold. Slime molds crawl yet are not animals. They produce spores but are not fungi. They grow stems but are not plants and, since they are alive, they are certainly not mineral. They are creepily weird. A strange brown growth atop a cut log recently caught my attention. It was a quarter-sized tuft of red-brown “hair” emerging out of the wood. 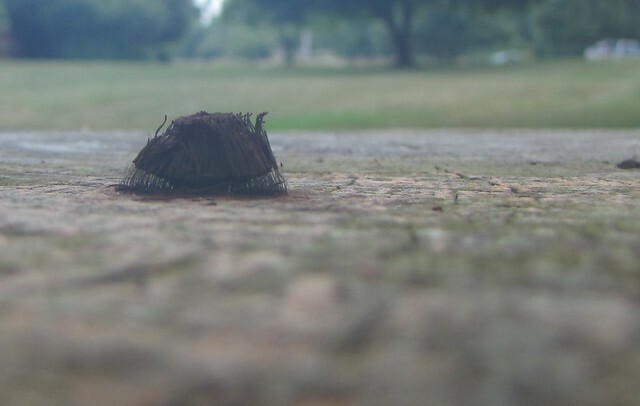 This peculiar structure turned out to be the fruiting stage of a type of slime mold called the Chocolate Tube Slime Mold. It took a bit of homework to make that designation because, well, honestly I kept looking to fungi for an answer (and the fungi did not answer back). Only a chance encounter with an illustration brought me about to the Chocolate Tube Slime Mold. It’s hard to believe that someone actually came up with such an appealing name for a mold, but there it is. 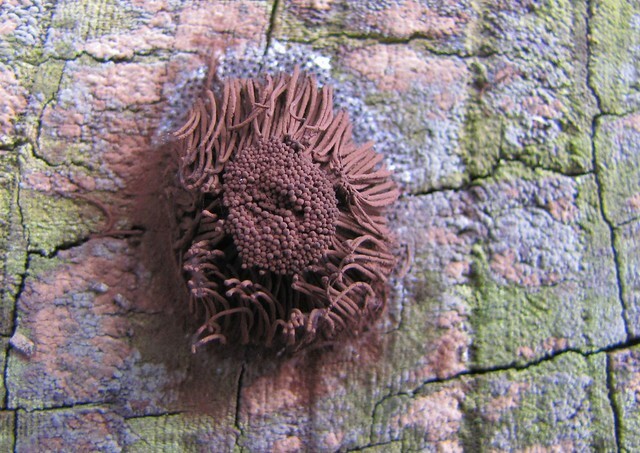 Officially called the Brown Stemonitis Mold, this thing still didn’t look like a slime mold per se. It was brown and moldy, but not exactly slimy. One description of slime molds describes them as “sprawling crawling plasmodium slime.” They slink about with extended pseudopods and feed on decaying wood. They do not root, but move about in the fashion of an amoeba (thus the animal like reference). When the food runs low, “they”- whoever “they” are – stop and gather their collective selves to produce fruiting bodies full of spores. The spores blow away into the wind to germinate into new slime molds. This example was beyond the slime stage and into the “we must leave” stage. The spore structure was a thing of beauty and not a random growth produced by some blob. It was at the stage where the collective must die so that the ONE may live on. 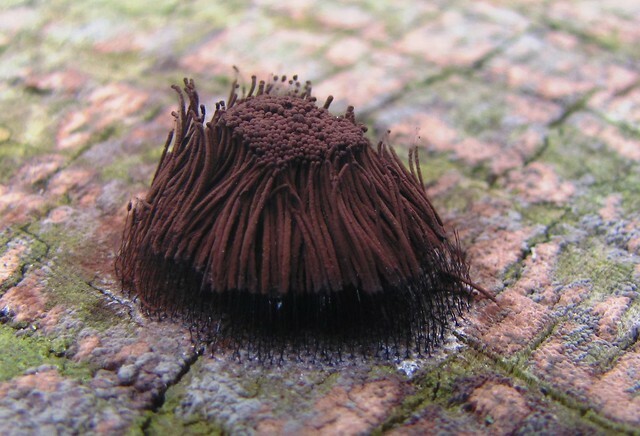 No, I can’t seem to think of this spore producing ameboid-like creature as a Chocolate Tube Slime Mold. I’m sorry, that is just too cute of a name for this life form. It is Stemonitis –“they” are Stemonitis. Now, tell me that you are not even slightly fascinated by this thing. You might have seen it if you are a PBS watcher. I am referring to one of their “get inspired” ads in which a frustrated composer sits at his piano among a pile of crumpled music. He can’t quite seem to find the right notes. Outside his studio window a flock of pigeons land on the power lines. Looking up from his work, the fellow visualizes the birds as notes arranged on a staff. He pounds out some tentative notes mimicking the arrangement of the birds and – voila! – he has the elusive beginnings for his score. Although the PBS commercial is a fictional scenario, the history of music is full of such natural inspirations. Usually the inspiration comes from another sound – such as the supposed use of the White-throated Wren’s song for the legendary four note introduction of Beethoven’s ninth symphony. I say “supposed”, of course, because I can’t quite remember if that incident was real or made up during one of my “Corn Nut Dementia” periods. But, my point is that nature can inspire. Coming off the dikes at Pointe Mouillee the other day, I was inspired by the sight of a line of perfectly spaced gulls perched on a branch in the river. The Ring-billed Gulls were so neatly arranged that they were easily imagined as notes in a music score. Unfortunately, due my lack of music transcription skills, that particular inspiration would have died on the spot – it would have remained a visual inspiration only. Fortunately I have a daughter, Katelyn, who is an orchestra teacher and violinist, so I was able to act on my whim. I shot a picture of the gulls and sent it to her via e-mail with a challenge: “Can you make this into music?” She did. The result is a wonderful mini-arrangement of 21 gulls into seven measures of music. “Gulls” by Katelyn M. Wykes is only a snippet. It is not a whole movement or symphony, but it could be (after all look at what Beethoven did – I think). One can only imagine what could be done with a continuation of the theme and the addition of some orchestration? At this point, none of this fancy stuff is necessary, however. This, ladies and gentlemen, is raw music straight out of nature. The only thing left to do is to listen to the music (listen here) and be inspired. Out on the warm windy flats of Pointe Mouillee there’s much to see & hear. It is an exposed open place. A dike walker stands out high and clear over the marsh, so is easily detected by the wetland residents. There is no real opportunity to sneak up on anything out here, but the trip is always worth it. Even at mid-day the place is alive with swaying cat-tail fronds and sparkling waters, cackling coots and grebes, and dozens of squawking egrets. The egrets are especially quick to launch into verbal protests whenever they are forced to vacate their favorite fishing spots as the lone human traveler passes by. The coots and grebes go quiet and slink off into the vegetation. The cattails, well, they continue to sway and hush whether you are there or not. The life on the dike itself is of a whole different nature than that of the watery marsh below. The thick growths of thistle, grasses, mint, and vetch growing along the path attract hundreds of butterflies and dragonflies. 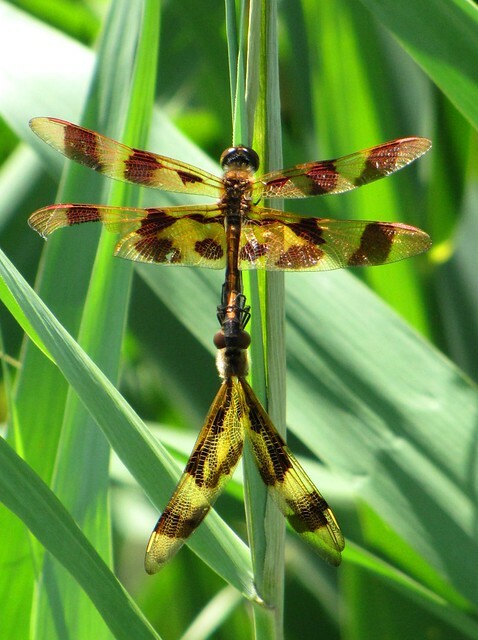 These flying insects are, at times, forced to buck the frequent wind gusts but all manage to land on their chosen flowers for nectaring, or – as in the case of the dragonflies – for perching. 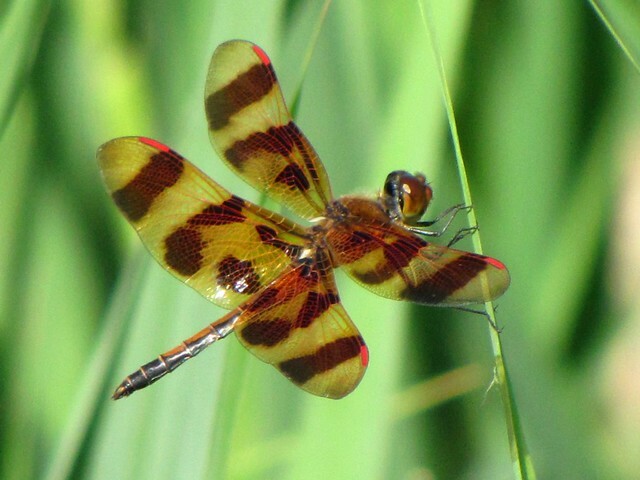 Perhaps no other creature in this wind whipped world is more noticeable than the beautiful Halloween Pennant Dragonflies. They are everywhere this time of year. 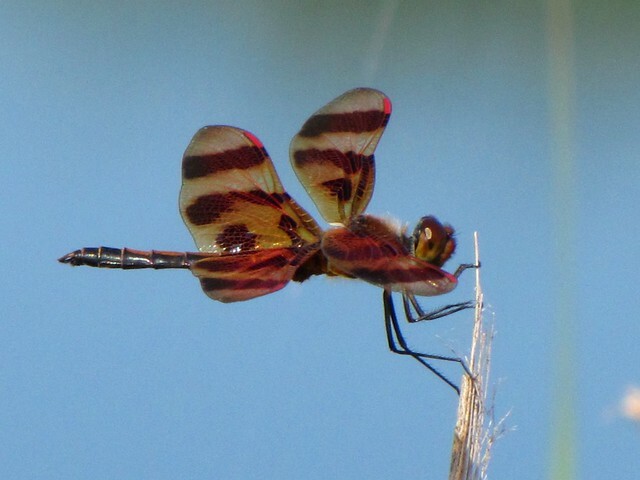 Pennant dragonflies are well named. 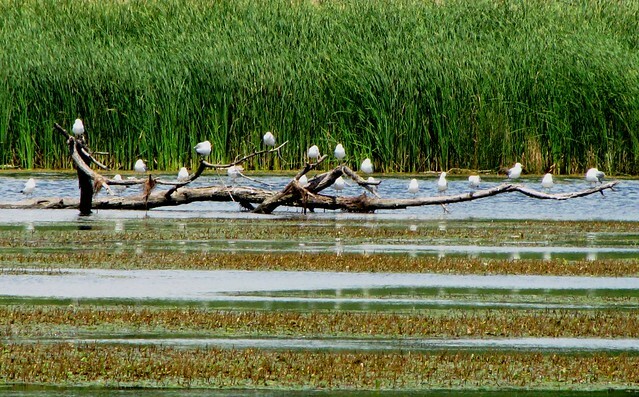 Members of this species group habitually roost on high stems and they do so in a manner that places their bodies nearly perpendicular to the perch. They pivot with the changing wind directions and display their vibrant colors like miniature banners in the breeze. Halloween Pennants specifically display a combination of rich Halloween orange wings adorned with a dark brown spot pattern. It has often been said that these medium sized dragons display butterfly-like colors and I can’t argue with that fact. Out on the Mouillee dikes the Halloween Pennants are at the height of their flight season. The males are wildly dashing about in search of the females. When successful, they grab onto them with claspers located at the very tip of their abdomens – locking them in a pinch hold just behind the eyes. Once joined, the pair seek out the solitude of a sturdy plant stem where the female can reach up into the male’s “special place” and pull out a sperm packet. This act is followed by a trip out over the water where the female will lay eggs while still in the headgrip of the male. At such a time, it is difficult to find a single Pennant. 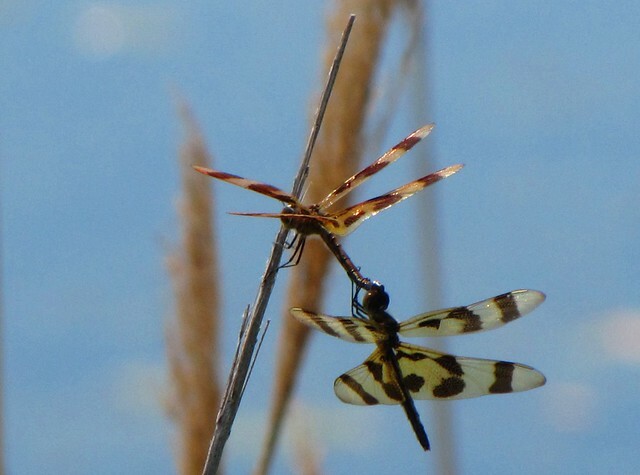 Most of the flying dragonflies are already locked into the tandem position. So, most the Halloween Pennants of Mouillee are ready made two-for-one deals. There is nothing as symmetrically perfect as a joined pair. They are, like the aforementioned (I’ve always wanted to use that word!) egrets and coots, skittish and difficult to approach. The clasped pairs are especially wary. Individuals will fly from stem to stem in a nervous search to find one hefty enough for support and then flit away at the mere suggestion of your approach. Only a careful observer can sneak up close enough to admire the details of their beauty but it is a worthy goal. I’ve raised a whole lot of caterpillars in my time. Early on in my captive (not necessarily captivating) caterpillar career I killed more than a few of them out of ignorance. The ignorance was mostly on my part and not the caterpillar’s, by the way. ‘Pillars require fresh green food and it was always a major task, often a major pain, to cut fresh greenery for them on a daily basis. I tried keeping their leafy food green by putting the twig ends in an open jar of water – you know, like cut flowers. That way, my captives could munch happily away on the freshest possible of salads. The best part? I only had to collect leaves on a weekly basis rather than a daily one. There was nothing wrong in my thinking, only in my methodology. I soon learned that the top of the water container needed to be sealed off. On several occasions I discovered that my caterpillars (Monarch and Polyphemus to be specific) would come to an untimely end in such an open water situation. They would commit unintentional suicide by crawling down the stem into the water and then drown. The poor little dead beasts would remain attached to the stem in their original life position. You might ask at this point why the creatures didn’t just back up? It’s not that they can’t physically back up, it’s just that they don’t feel a need to in this situation. Before they realize it, their laterally located breathing pores (spiracles) are immersed and they suffocate. It was, and is, that simple. It was, and still is, an amazing thing to see. 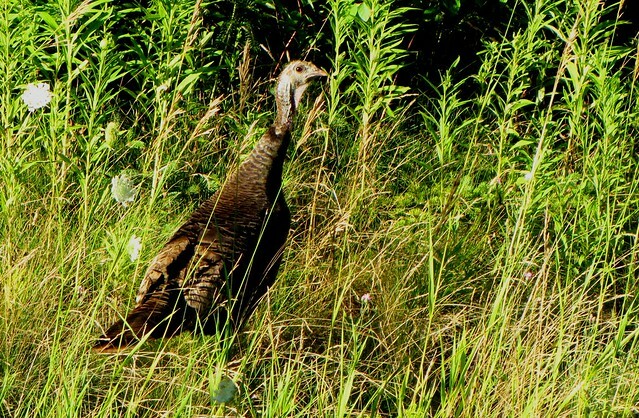 I can only think of the legendary stupidity of domestic turkeys that are said to drown in rainstorms when they forget to close their bills or lemmings blindly jumping to their death off sheer cliffs. O.K. the latter incident was artificially created by Walt Disney, but it is a fact that Caterpillars and water don’t get usually along. Today, I use fresh cut leaves to raise my caterpillars. 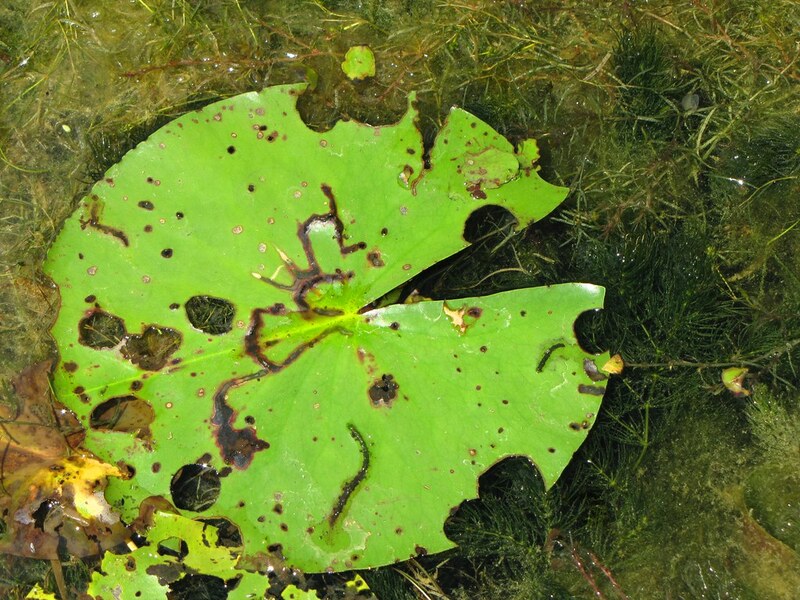 Oddly enough, not all caterpillars avoid water. In fact, there are quite a few that actually live (and breathe) in it. 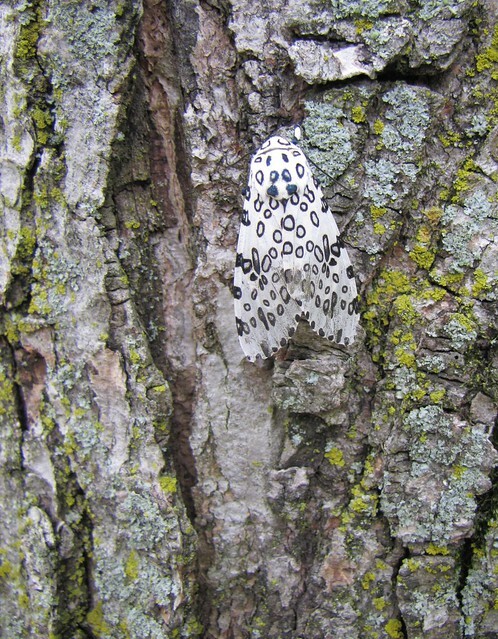 In Michigan alone, there are some 34 species of aquatic or semi-aquatic moths. 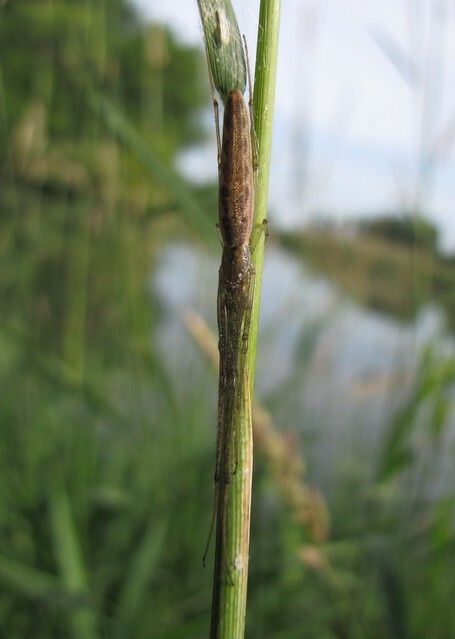 In all cases, it is the larval stage that is actually aquatic. 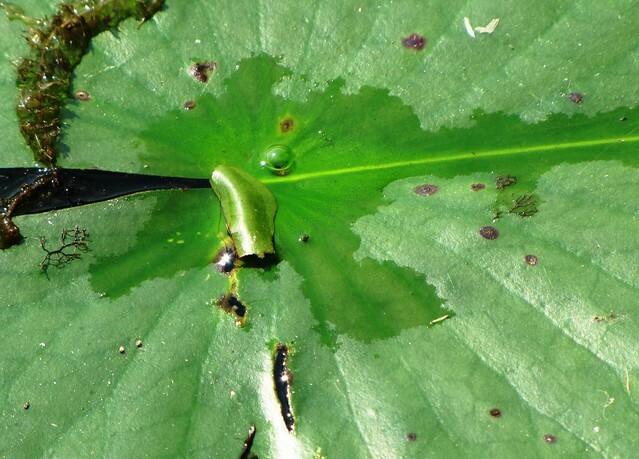 My attention to this fact was recently focused by the sight of a piece of Spatterdock leaf crawling across a very wet water lily pad on Dollar Lake (see beginning photo). I reached down to pick up the oval shaped piece and discovered a fleshy larva semi-encased within. It was the caterpillar of the China Mark Moth. The China Mark spends its entire larval life in the water. Because they are succulent bits of desirable fish food, the caterpillars protect themselves by covering their bodies with an artificial shell. This structure, much like a turtle shell, consists of a large upper “carapace” made out of a single large oval segment and a lower “plastron” of smaller leaf segments. The whole thing is held together with a silken bag. 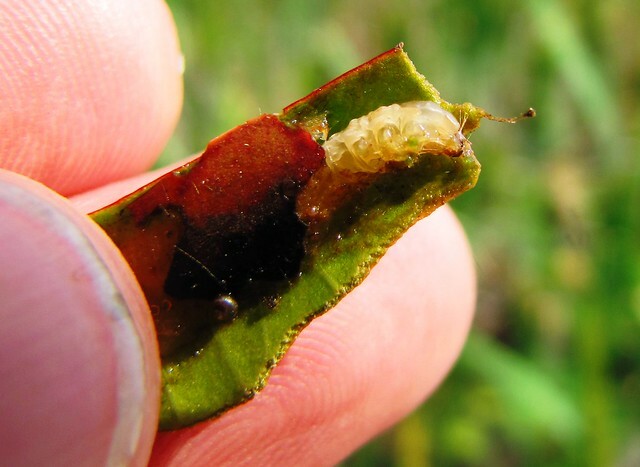 As the larvae grow they cut new leaves to cover their larger selves. 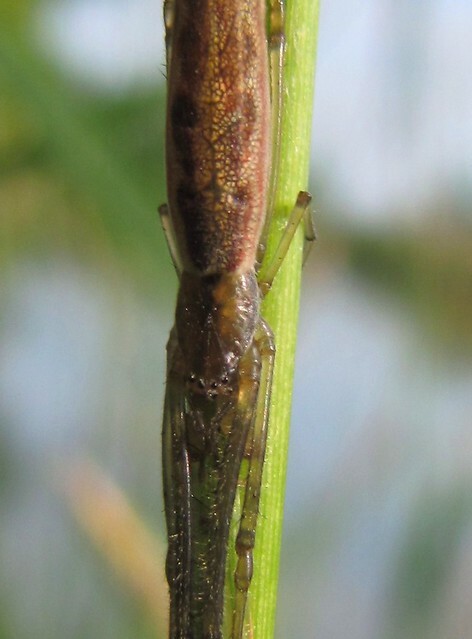 Totting their mobile home about in the manner of a caddisfly, they crawl with their set of pro legs, eat with their head extended out, and retreat into the confines of their home when threatened. 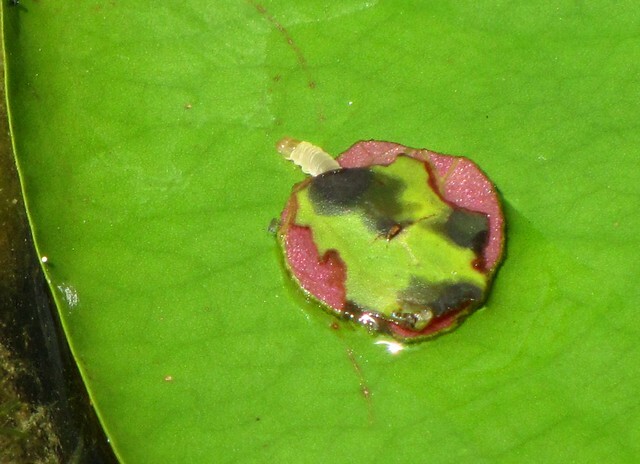 More often than not, they will hang out on the completely submerged underside of the leaf. On occasion, they will cut loose and float around until making contact with fresh water lily. So, not only do these fellows swim, they also navigate on tiny ships. A sailing worm – who’d figure? In the world of aquatic caterpillars, there are those who have external gills and those who do not. The China Mark larva does not. They look pretty much like your average caterpillar, only wetter and livelier. I did notice that the individual I encountered (and shown here) had an air bubble entrapped within his casing. He was actually positioned directly over a stream of bubbles issuing out of a severed section of water lily stem when found. I can not be sure whether this was an intentional thing or not (see below). 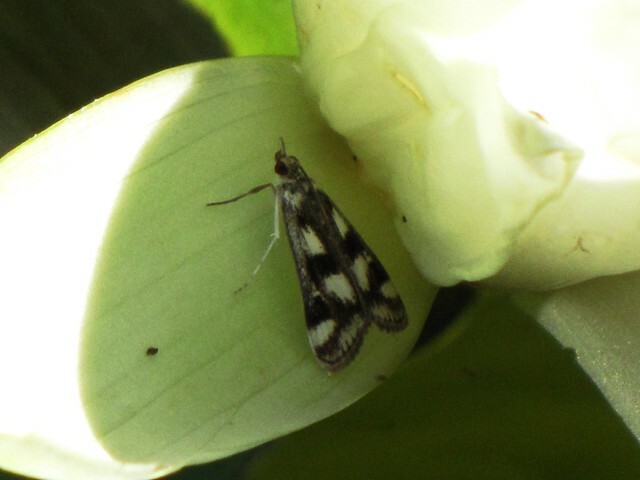 Unfortunately, there is not a whole lot of easily accessible information out there regarding China Mark Moths other than references in aquatic gardening sites which view it as a pest species. Obscure lepidopteran references only contain descriptive terminology and little life history. I therefore have no further tid-bits of wisdom to share on this subject without starting to make something up, so I will stop. I do know that the common name refers to the marks found on the adult moth (a dry winged critter that can walk on water but not immerse itself in it). In common jargon, however, the encased aquatic caterpillars are often referred to as “sandwich men.” I guess that name could be a double meaning if you consider that sandwich to be a Submarine sandwich? Over the recent 4th of July celebration I saw, and heard, a great many pyrotechnic displays. It seemed that every backyard erupted with flares, popping firecrackers, and smoke – lots of sulfurous smoke. As darkness fell, the official community firework programs began as rockets were launched high into the night sky and terminated with explosive starbursts. Like giant sizzling flowers with luminous stems they briefly sprouted and quickly faded. The remnant smoke shadows slowly drifted down and away as new blooms took their place. I was struck how closely these phantom smoke patterns looked like dandelion heads, or to be more specific, like Goatsbeard heads. I am using floral language to describe these fireworks extravaganzas because they did remind me of several current blooms. 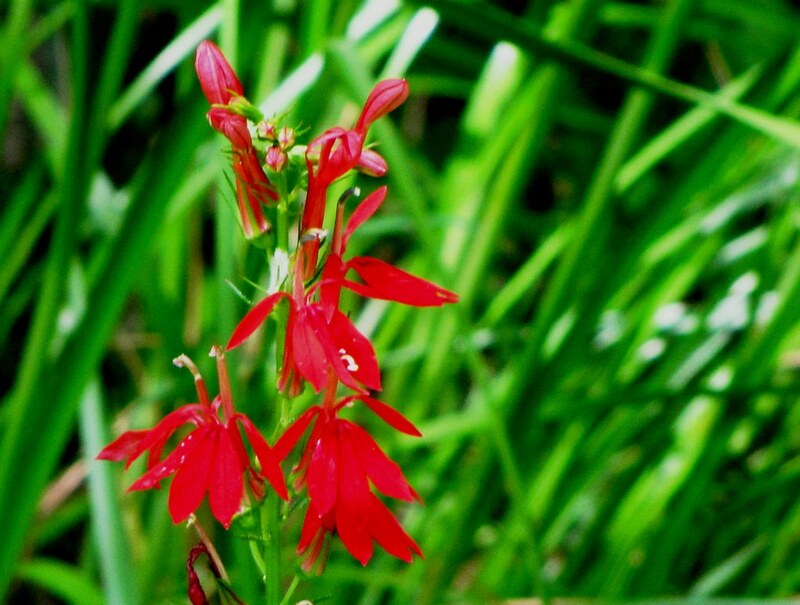 A number of summer plants can be viewed as silent firework displays. Although their actual scale is far less impressive than the aerial bombs, on their own terms they are equally as impressive (and visible in full daylight, I might add). I am specifically referring to the pom-pom blooms of the milkweed, the arching spray of the iris, and the smoky puff balls of the Salsify seed head. 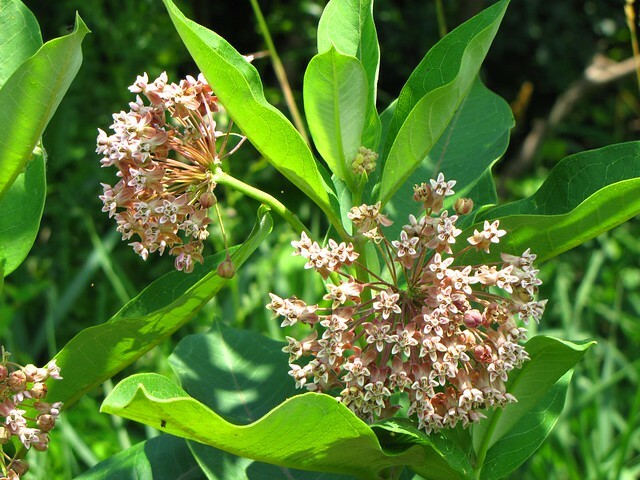 The circular flower clusters of the Common Milkweed (see above) are not to be ignored this time of year. Theirs is an explosion of pink. If fireworks, they would explode with a “poofs’” rather than loud booms. 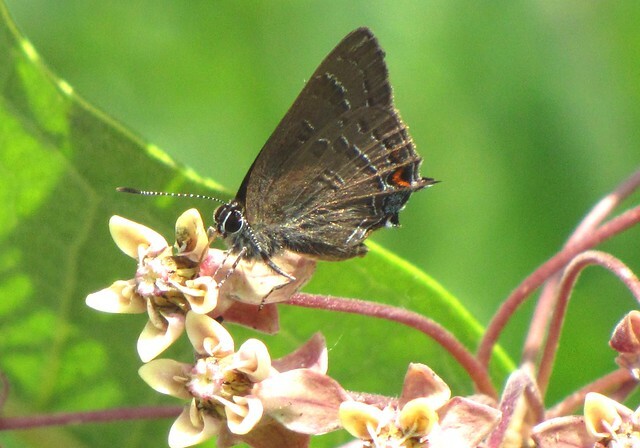 They are irresistible to nectaring insects and rare is the milkweed flower that doesn’t have a visitor of two at any given time (such as the Banded Hairstreak shown below). They emit the heady odor of old lady perfume rather than that of sulfur and saltpeter. In the category of Roman candle fireworks – those that spray up and out like fountains – the Wild Blue Iris fits the bill. One fine example of this flower caught my eye while walking the backside of Tawas Point over the holiday weekend. While all the tourists were on the Lake Huron beach side, I was seeking inspiration in the marshy wetlands on the wind-protected side of the point. 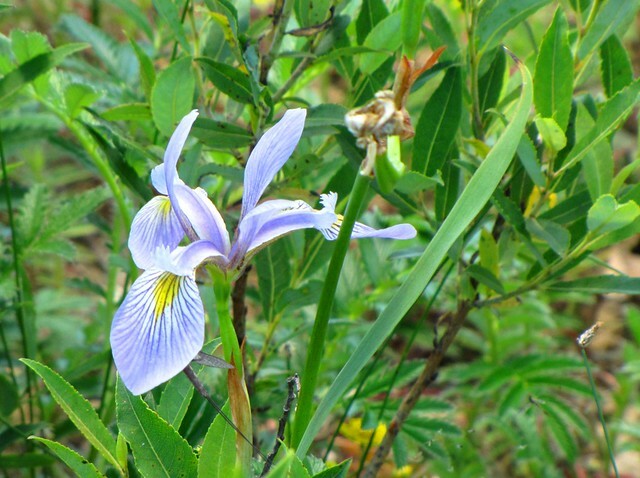 A tiny blue iris, sheltered within the scanty shade offered by a lone willow sprig, stood out on the barren flats. 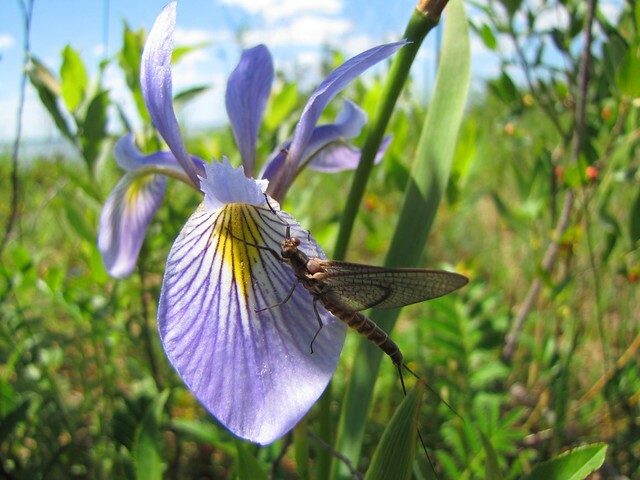 I was struck by the minuscule size of the flower (see above the scale as compared to the mayfly on one of the petals). I briefly held out hope that it was an example of the precious Dwarf Lake Iris of northern beach fame, but the rare Lake Iris is a much smaller plant overall with blooms only a few inches across. This bloom was more like 3 inches across and the stem about a foot tall. No, this was a perfectly dwarfed specimen of Blue-Flag Iris. Normally these plants would be several feet high with large floppy blooms. It appears that the rigors of open beach life forced this individual to do its thing on a small scale. It was an exquisite little piece of miniature fireworks. 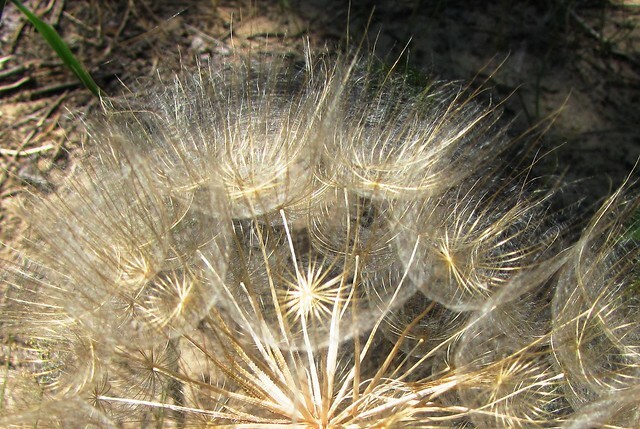 Perhaps no other plant looks more pyrotechnic than the seed head of the Salsify (see beginning photo). When in bloom, this large relative of the dandelion looks impressive enough with its yellow petals, but is not especially noticeable amongst the summer greenery. The seed heads, however, do command attention due to their large size. 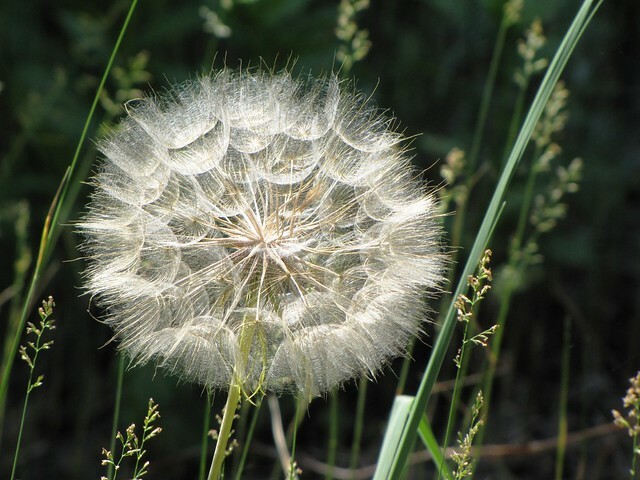 They form perfect balls with the seeds attached to a center button and the silky parachutes facing outward – again, like dandelion seed heads, but on a massive scale. When framed in the morning sun, these puffy seed heads glow with a firework-like intensity. The Salsify heads are, of course, temporary. They are meant to be blown apart by the winds or immediately disassembled by a child’s breath. The Salsify is often called the Goatsbeard, due to the hairy nature of the seed heads, but they are also known as Oyster plants. This name refers to the oyster-like taste of the roots which can be harvested and cooked. No matter how you look at it, the Salsify is a plant of visual and literal good taste. In the category of creatures hiding in plain sight, I bring you a few more candidates. Cryptic critters are always fascinating because their “crypticness” (not a real word, but sue me) relies on a combination of coloration and behavior. The best can hide in plain sight; unlike you or I who can hide but only if we envelop ourselves in dead grass or behind something. Unless they are highly toxic, both predatory and prey creatures have to hide for a living. I recently came upon an example of each – accidentally, of course. Gas stations, as a rule, are always great places to find insects. It makes no difference what the brand or what the price happens to be (however, I do tend to see more insects at lower price gas stations for some reason….hmmmm). They are 24 hour operations with bright lights to attract all manner of nocturnal insect life. One station, near Midland, was the scene of a massive invasion of June Bugs. By June Bugs I mean those caramel brown beetles and not the sometimes-used-name for mayflies. It was early June and there were thousands of them scattered about on the pavement in various states of flatness. Live ones bumbled about in the morning light like hung over party guests while others simply died laying on their backs. The beetles were not hiding, but my first cryptic critter case was at a CITGO Gas station. Blending in nicely with the gray speckled concrete at the base of the pump island, a large Leopard Moth did his level best to be “at one” with his surroundings. I’m sure it wasn’t his choice to spend the day there but he probably had little real say in the matter. The bright city lights were too much of a lure. These are large white moths and you’d think they’d stand out like sore thumbs against such an artificial backdrop. They certainly aren’t adapted for this environment. 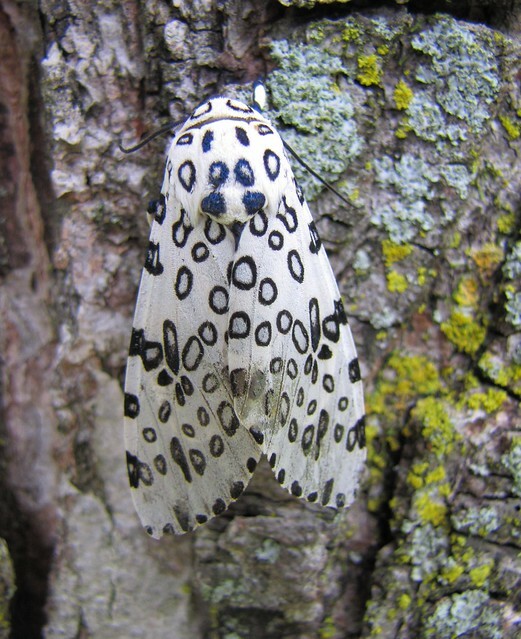 The name of this creature stems from the plethora of circular leopard-like spots covering the wings. These – like the feline spots – serve to disrupt the creature’s outline and allow it to blend into any grayish backdrop from old concrete to lichen covered bark. I opted to take the creature home for some formal portraits since I was highly distracted by the horridly high number appearing on the gas pump window above it. While later setting up his shot I noted another character of this moth. The wings were semi-translucent near the edges (see here). This would be due to a natural thinning of the scales resulting from repeated nights of vigorous flying, but it would serve well to further disrupt his outline. Indeed, when placed on a natural tree bark outline he blended in admirably. A Leopard needn’t change his spots to adapt to all manner of situations. The other example I want to put before you is a predatory beast – a spider, as a matter of fact. Even though spiders are insect eaters, they are also eaten by larger predators and so must hide. While most secret themselves into silken tubes or folded leaves during the day, the Long-jawed Orb Weaver gets long in order to live through the light time. This spider has extremely long legs (and jaws) and they perch with an equal number of appendages pointing forward and back. Because they align themselves parallel to grass stems and sticks, they blend by behavior. As you can see in the photo, the Long-jawed Orb Weaver that I encountered was not blended to the grass by color, but because it took on the linear lines of the grass stem. It was invisible. Even on close inspection it was hard to make out how the spider was positioned and what part was where. In the detail photo (below) you can make out the eight black eyes and long abdomen. The critter was pointing down. Just in case you are wondering, apart from the long-jawed thing, the name of this spider refers to the fact that it is indeed an orb web weaver. They are not related to the typical group of orb weavers (garden spiders, shamrocks, and the like) but still make a type of centrally radiating web. Their webs are simpler than those of the real orb weavers (who, by the way, have to sneak into silk shelters to hide). So there you have it – a spotted leopard that is hard to spot and a spider who sticks to his line.